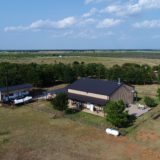 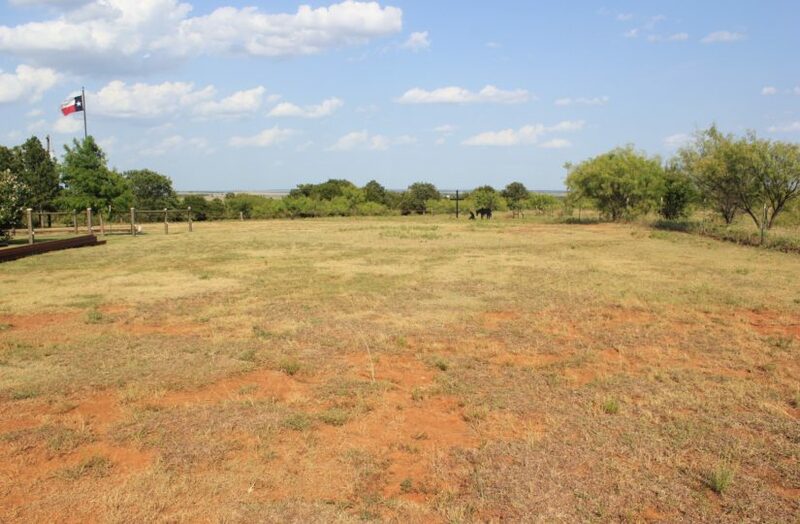 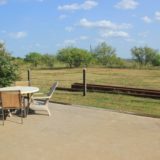 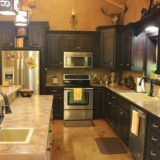 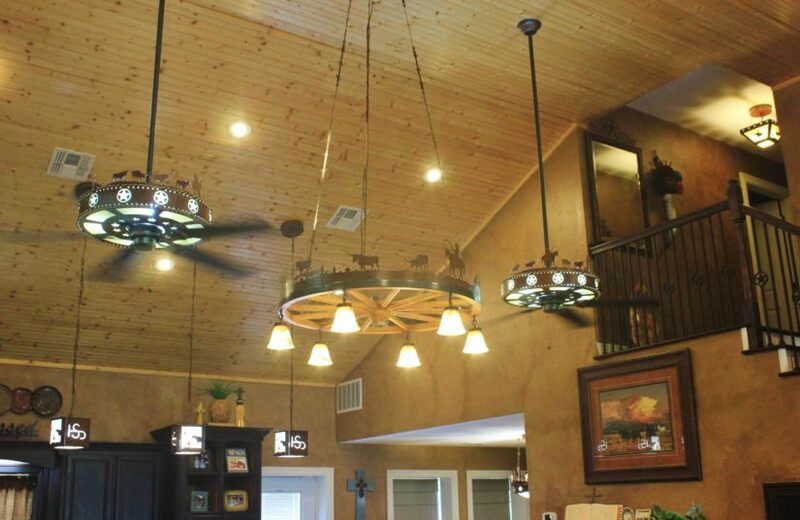 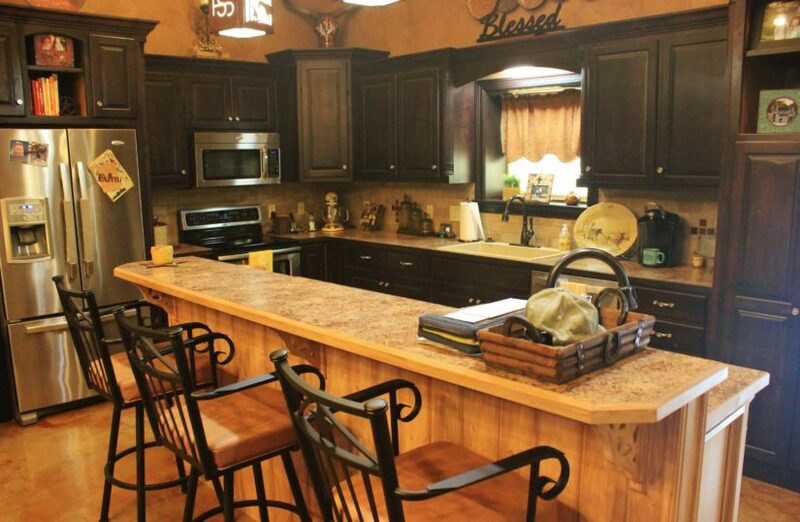 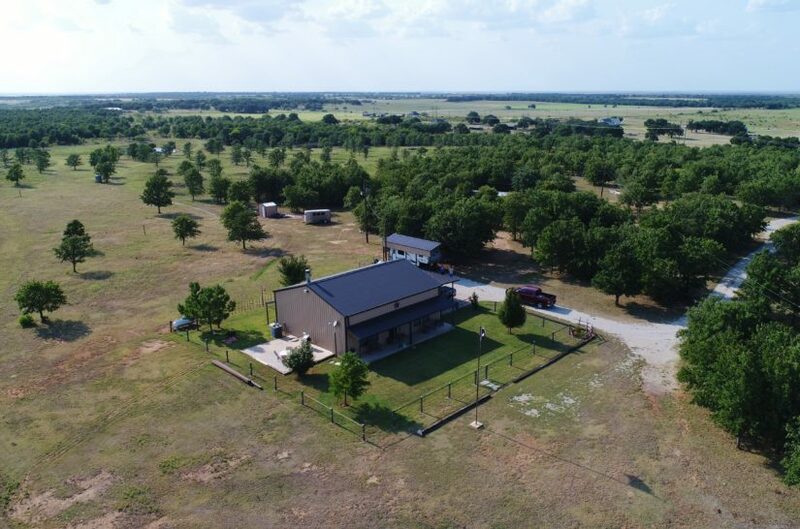 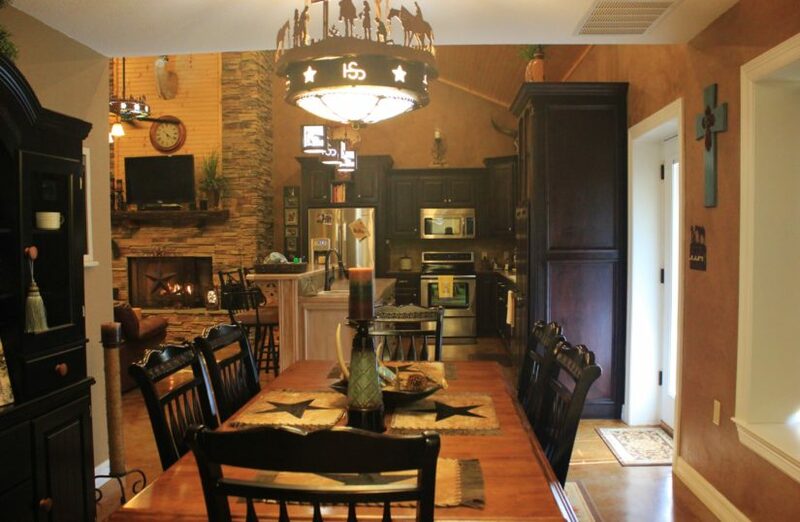 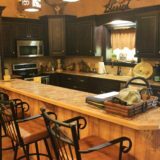 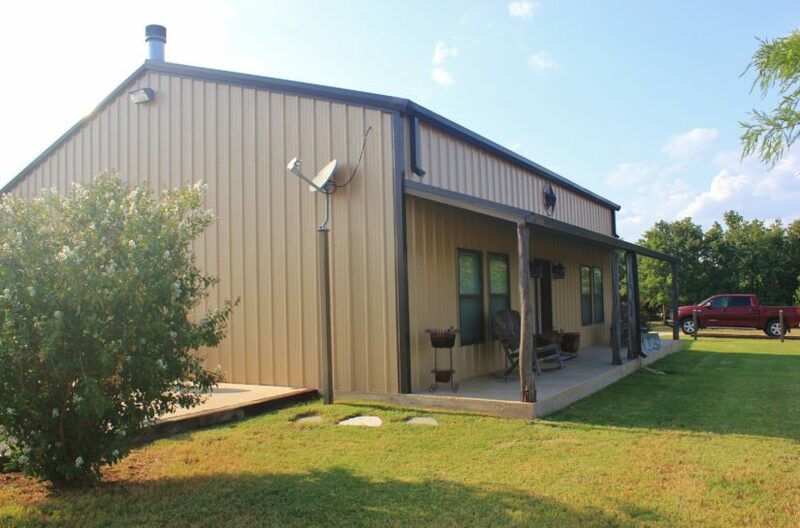 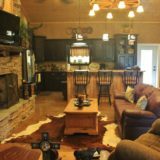 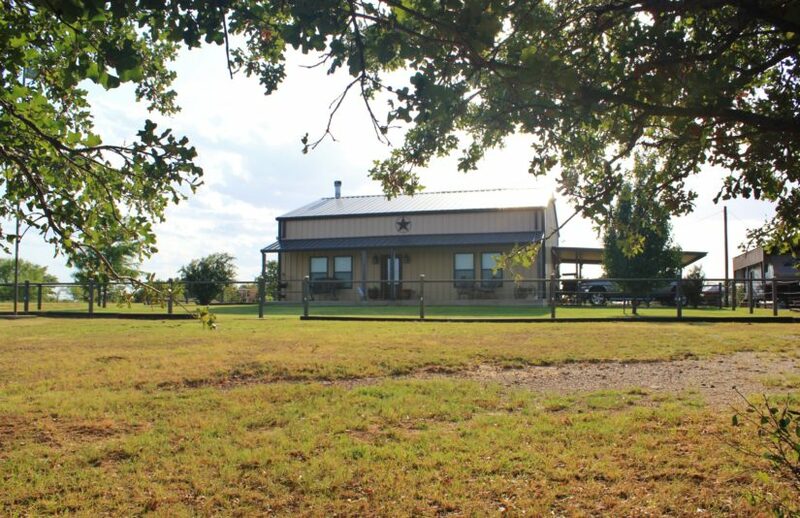 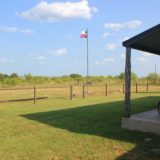 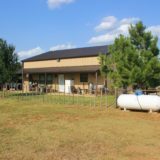 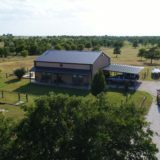 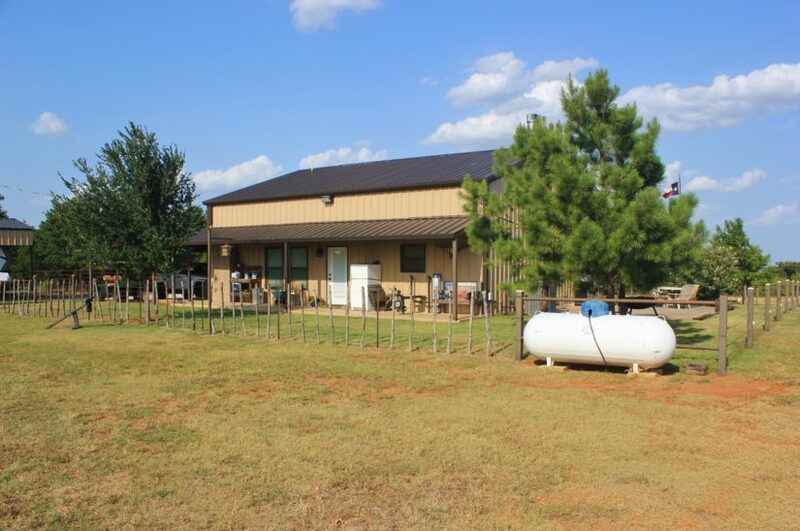 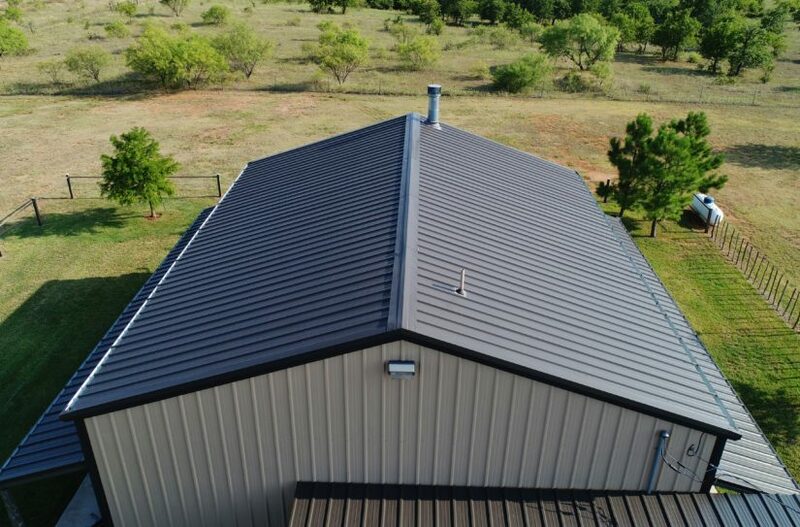 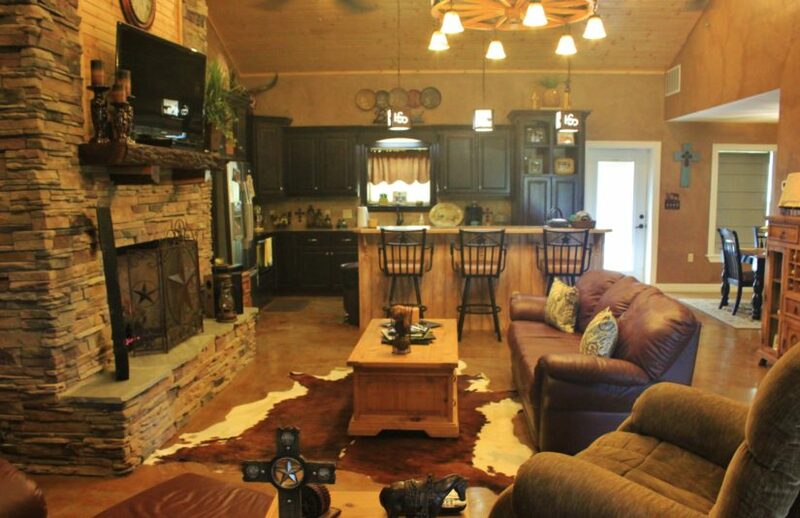 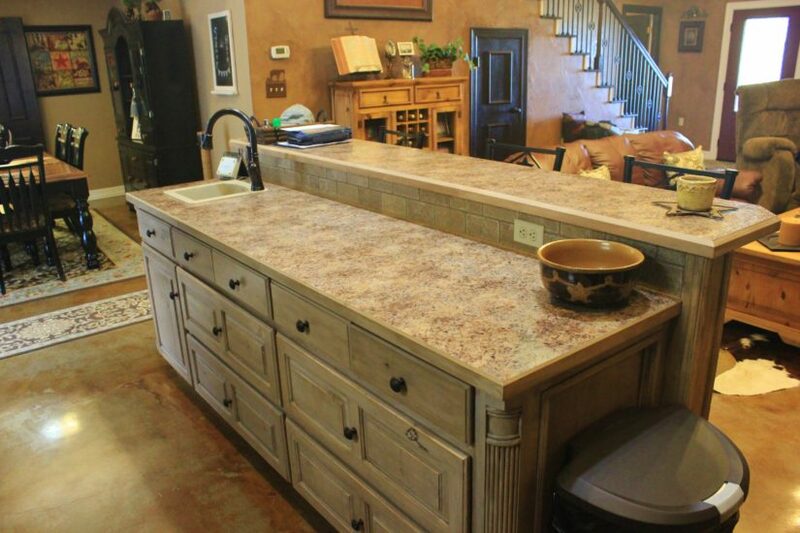 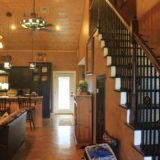 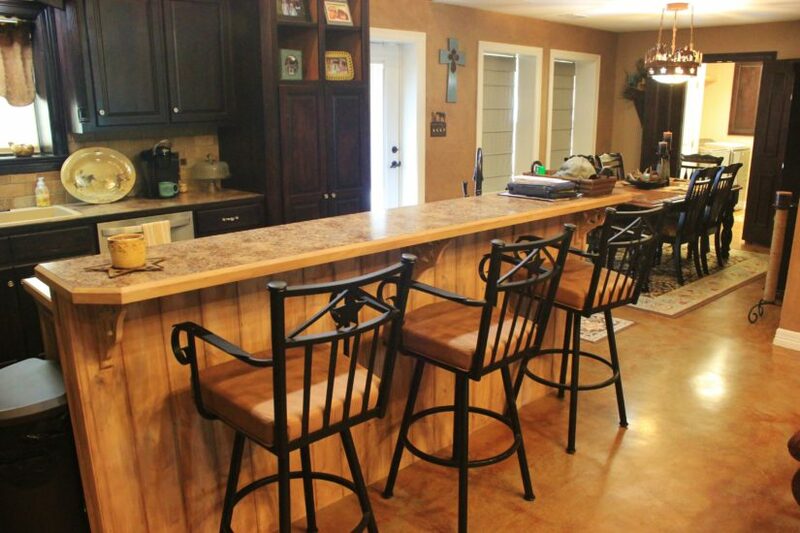 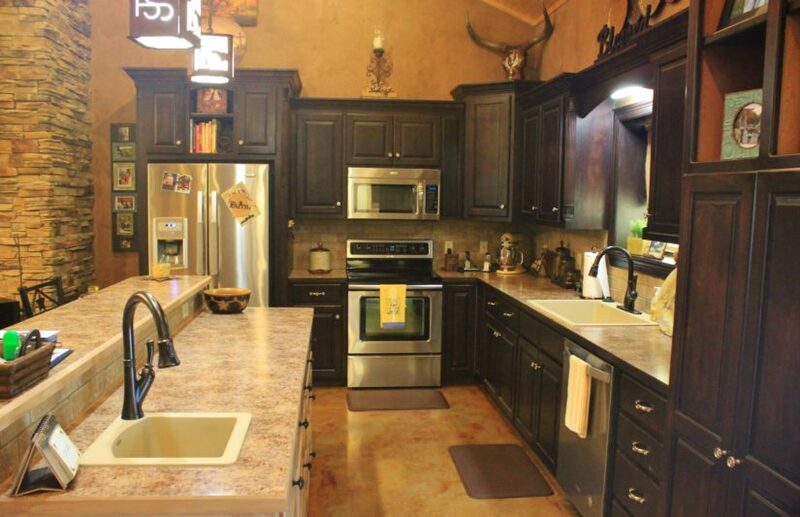 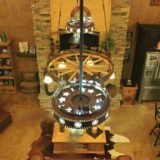 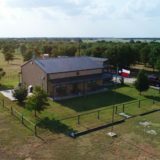 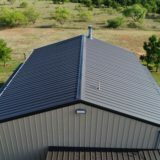 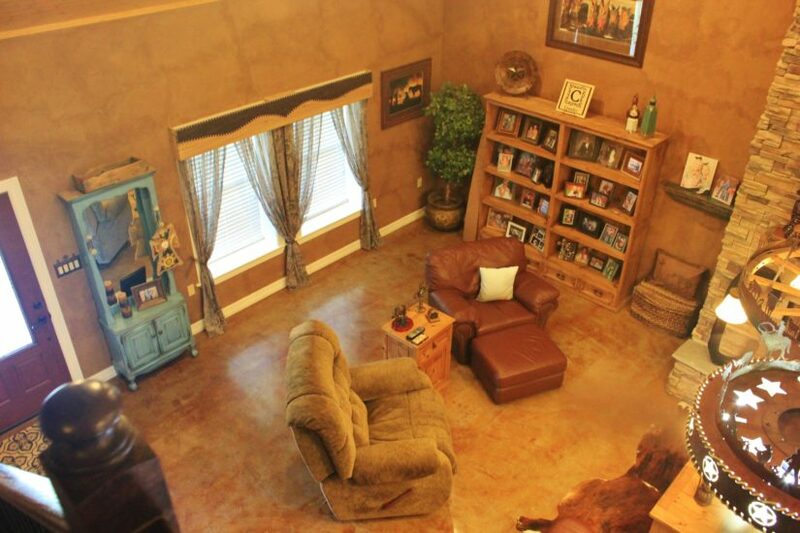 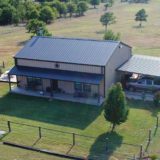 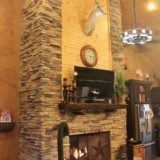 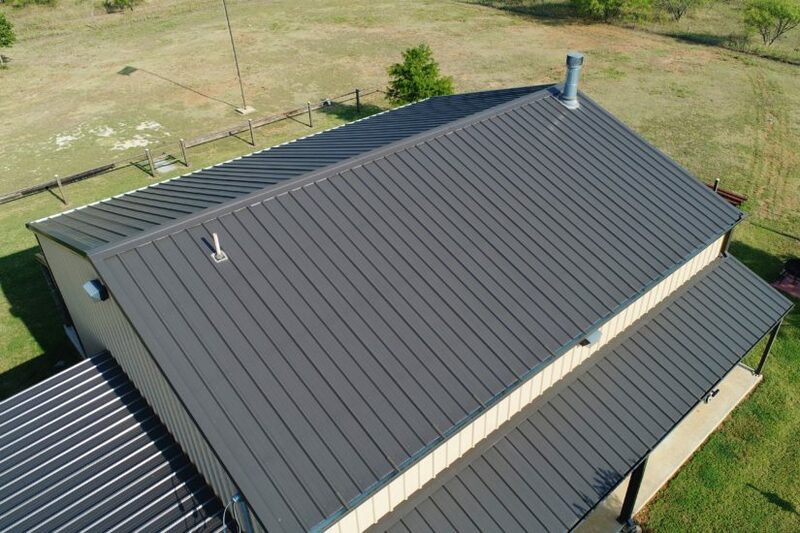 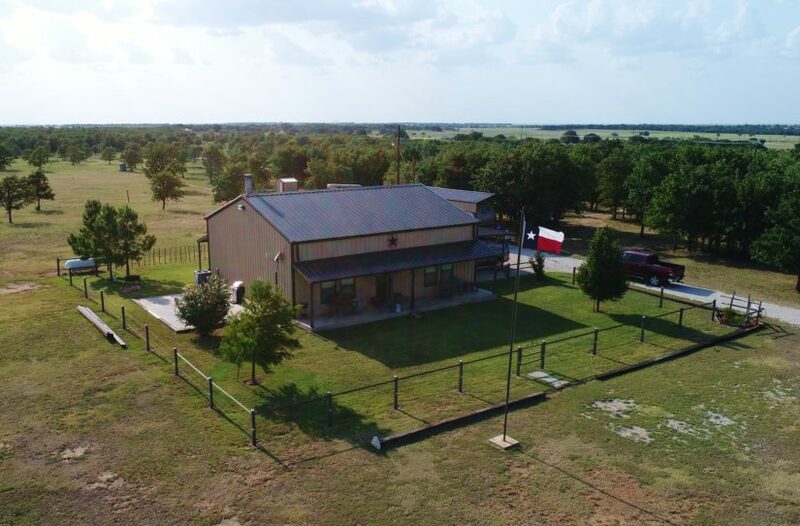 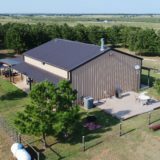 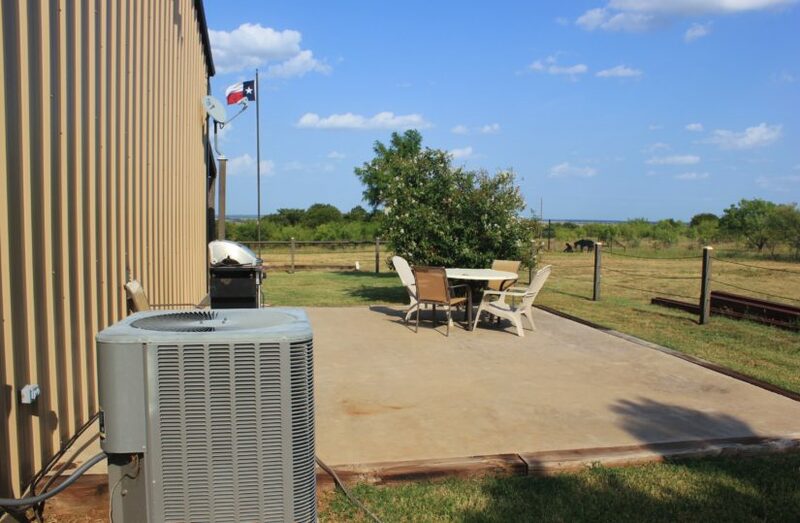 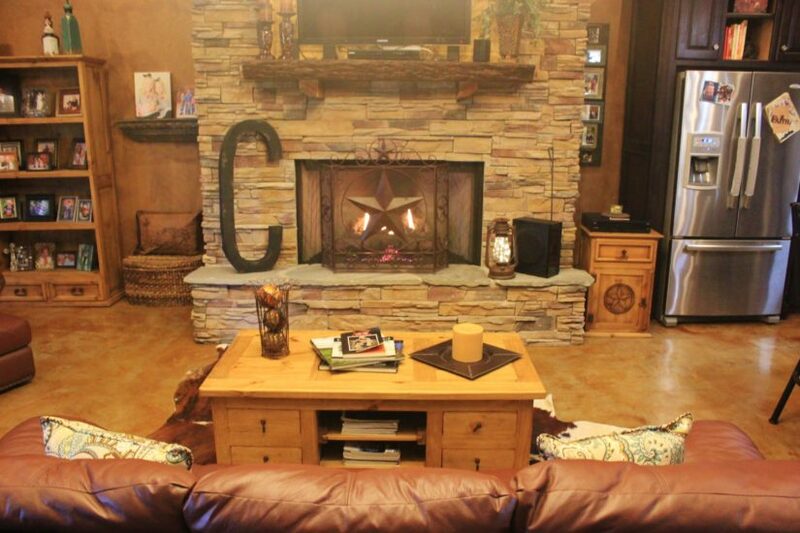 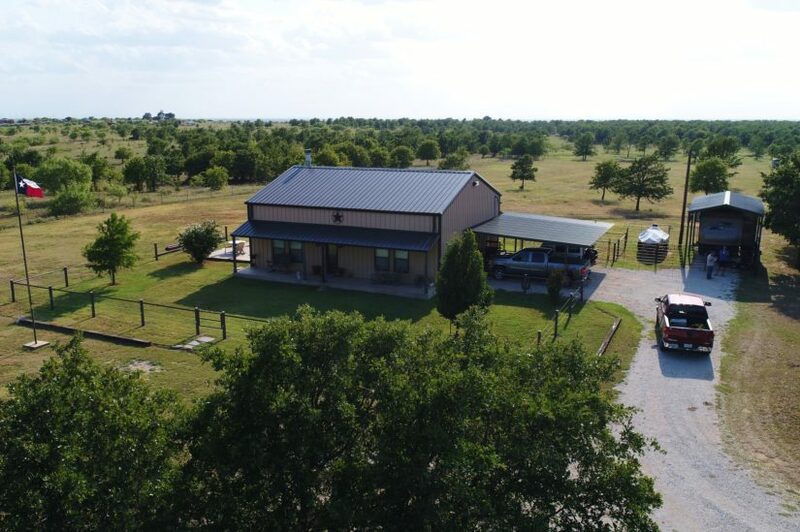 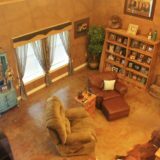 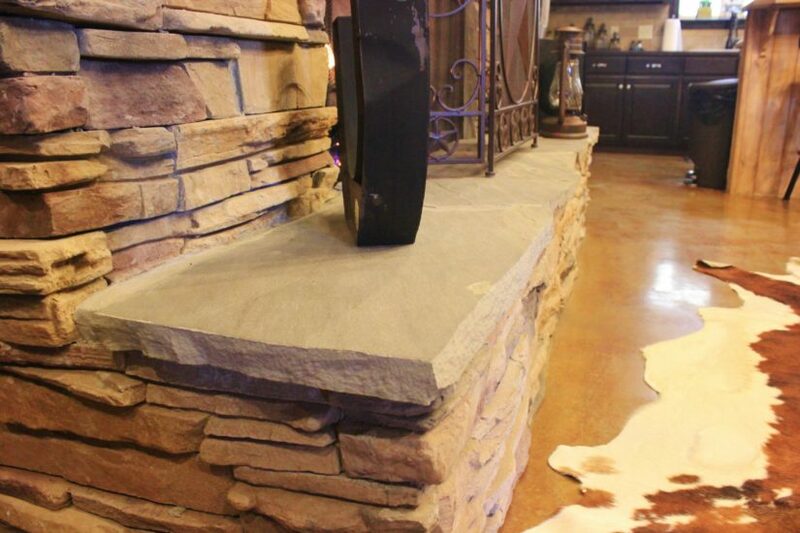 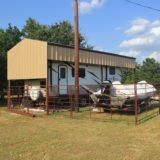 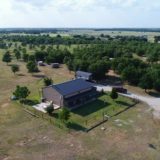 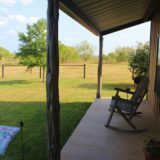 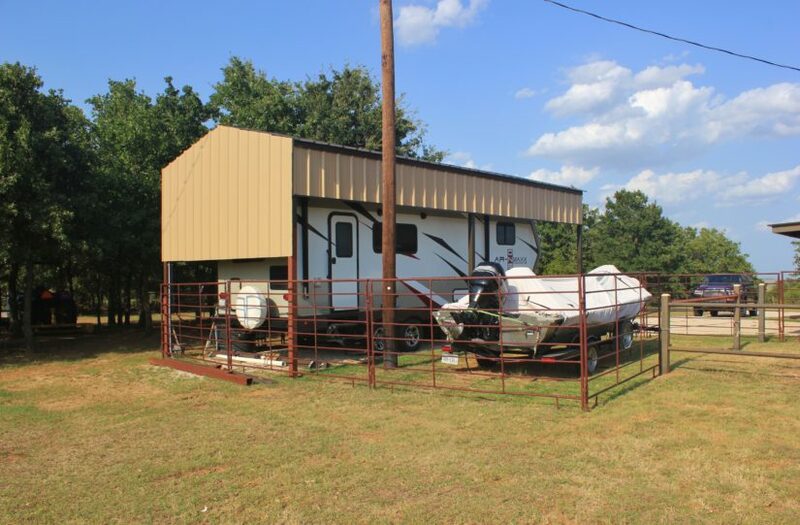 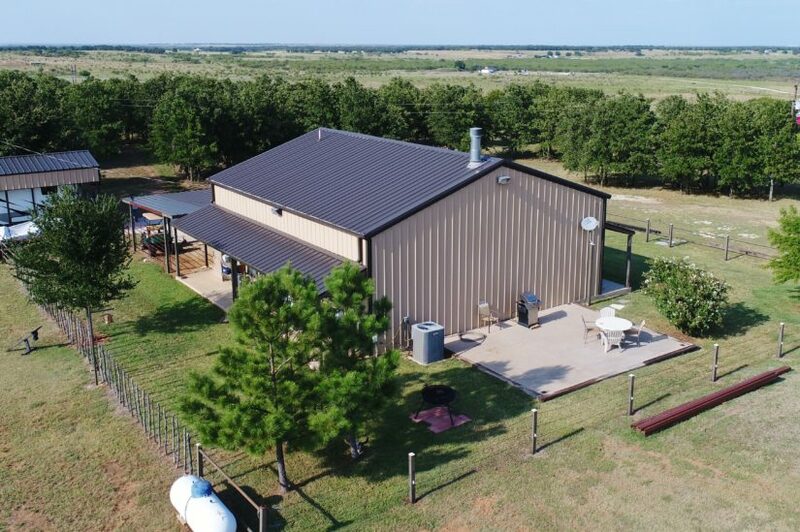 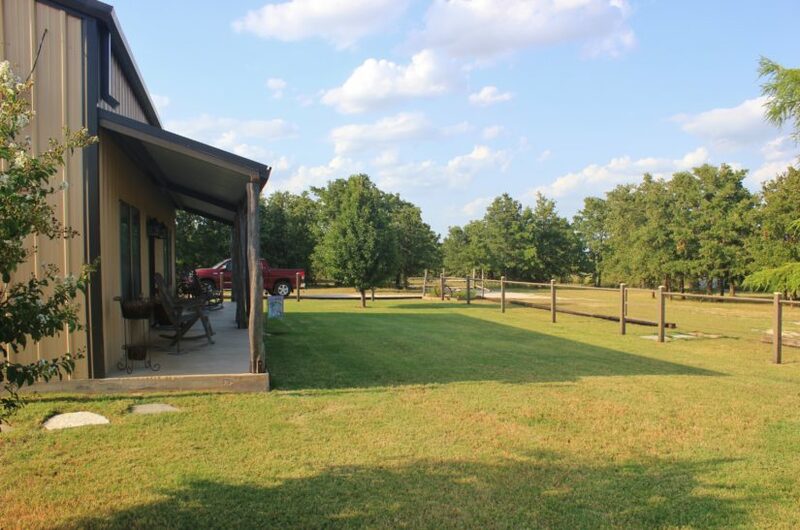 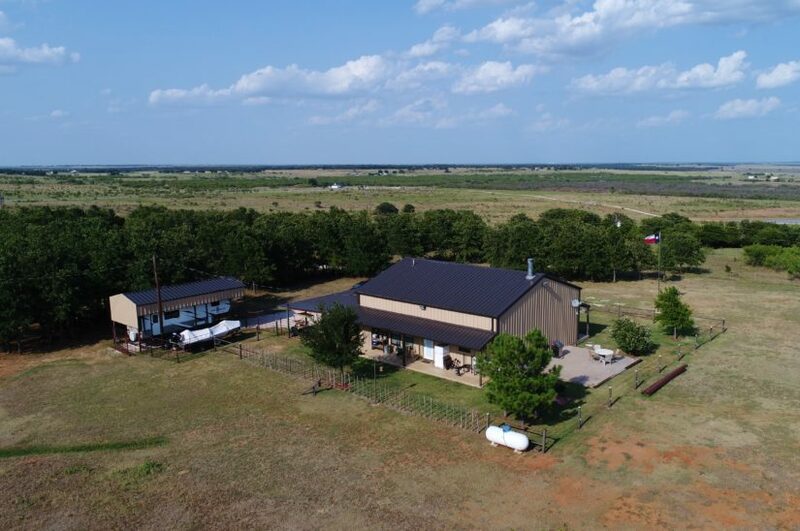 Custom barndomium home for sale, sitting on two acres on a hill south of Bluegrove in Clay County, Texas! 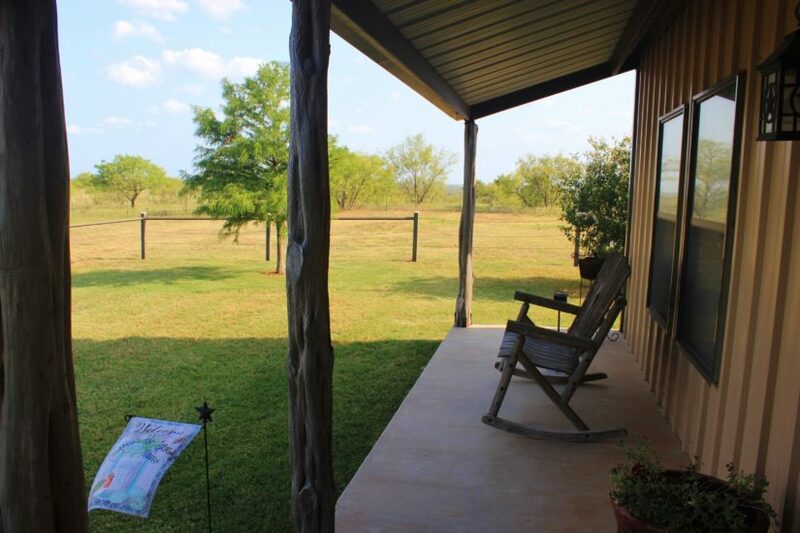 EVERYTHING is beautiful here, from the custom features of the home to the views across the countryside! 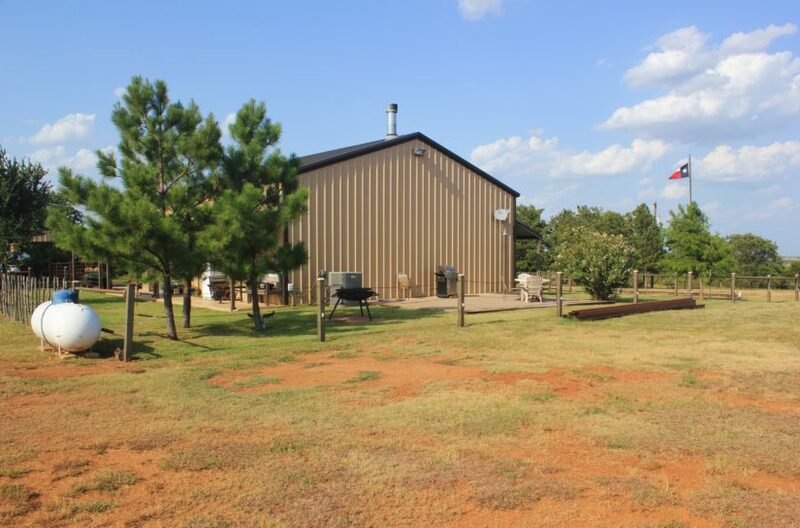 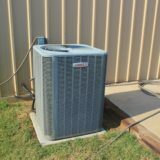 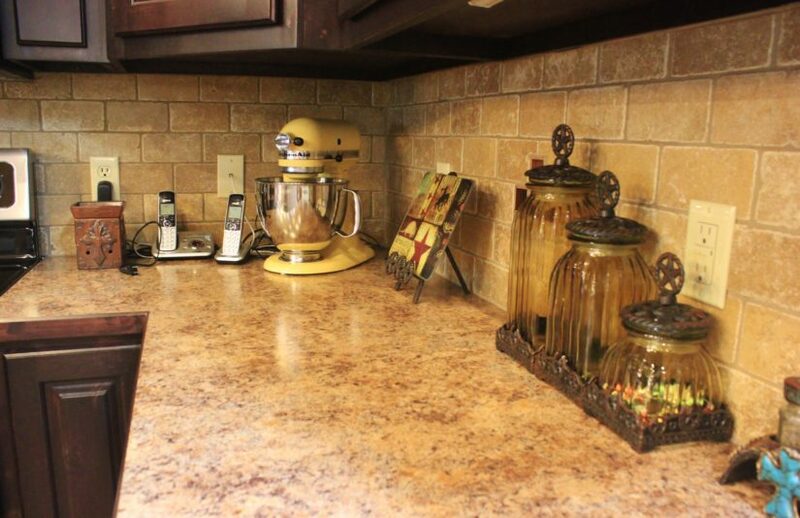 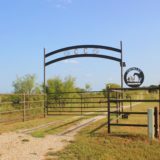 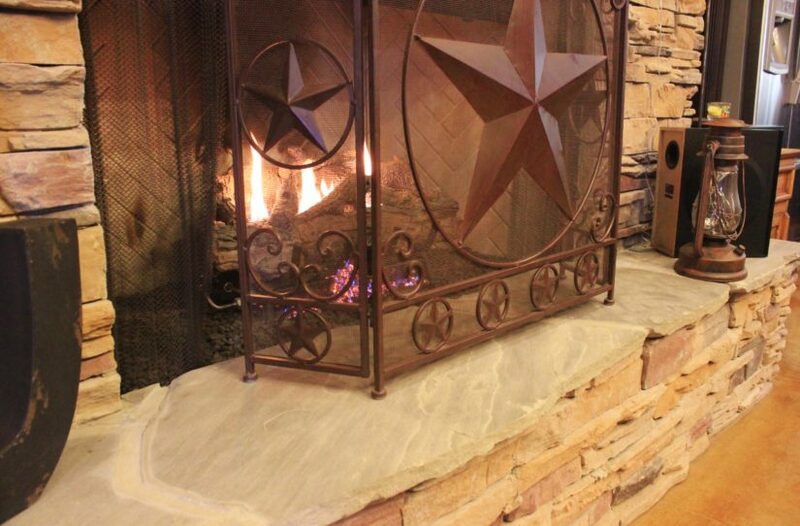 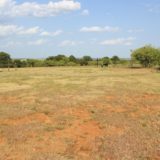 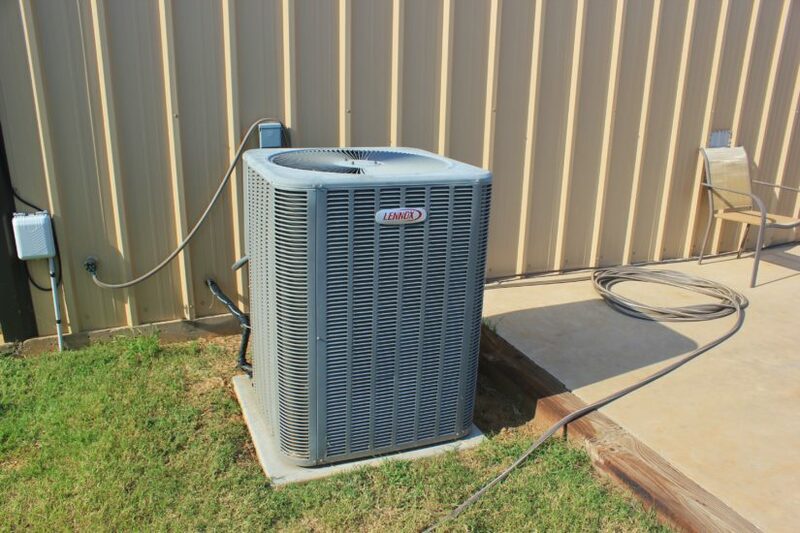 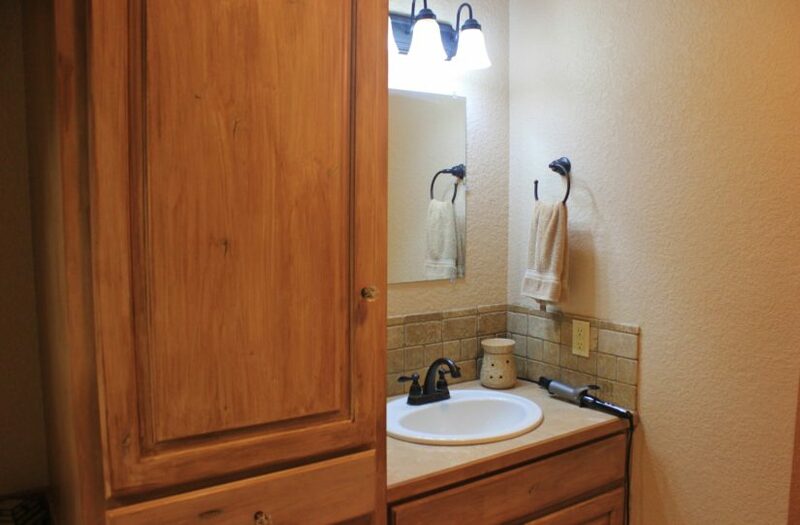 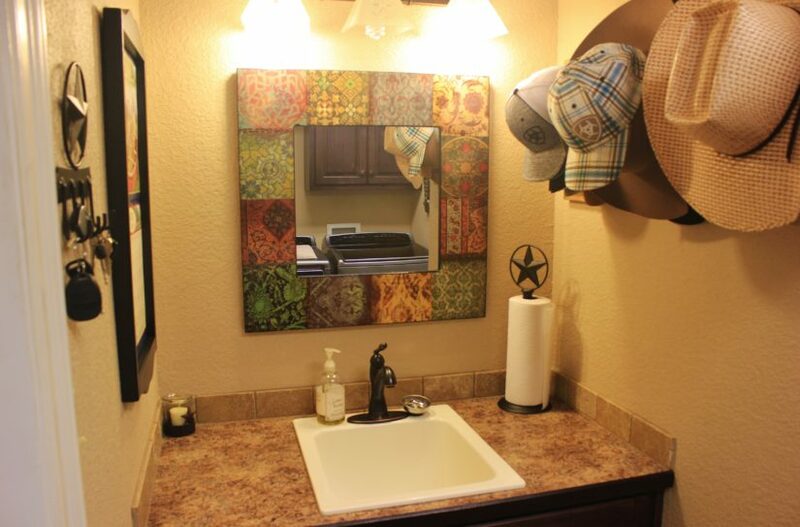 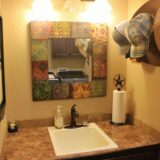 Located just 30 minutes from Wichita Falls, it’s close to everything you could need. 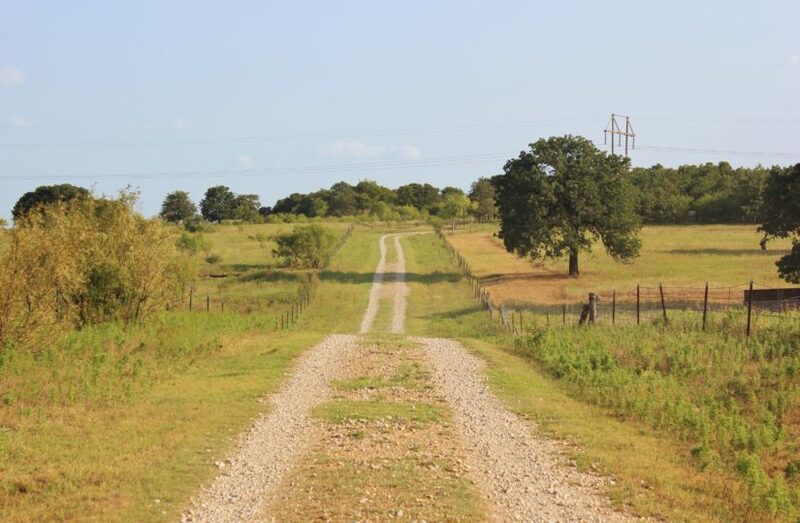 The two acres, where the house sits, is accessed by a deeded easement coming from FM 1883, a paved road. 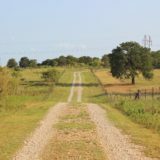 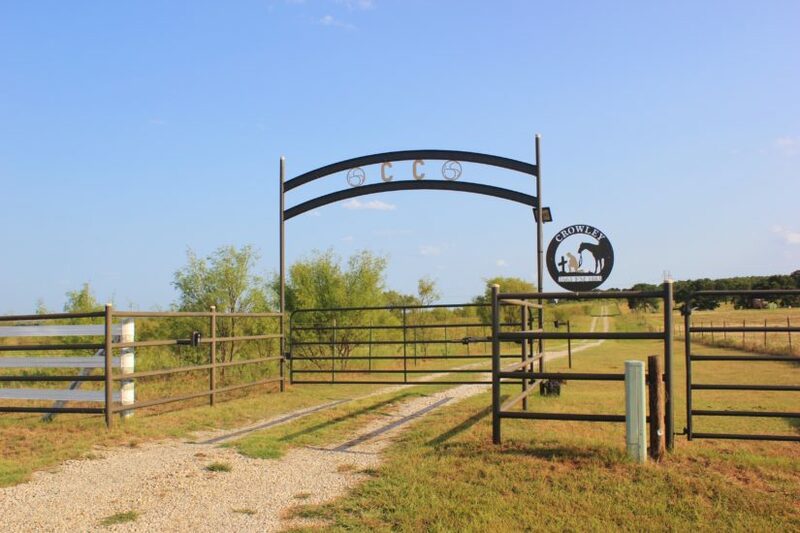 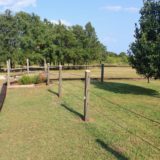 This easement is approximately 35′ wide and 1,913′ long; it straddles a graveled ranch road with a fence on either side of it for about 1,200′, then winds through scenic oak trees for another 700’+ before reaching the home at the top of the hill. 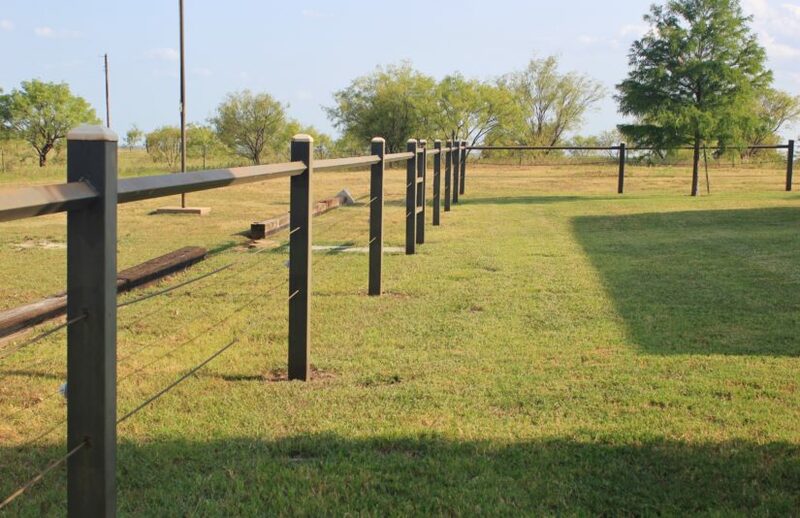 An electronic gated entrance is located at the FM road, built out of pipe. 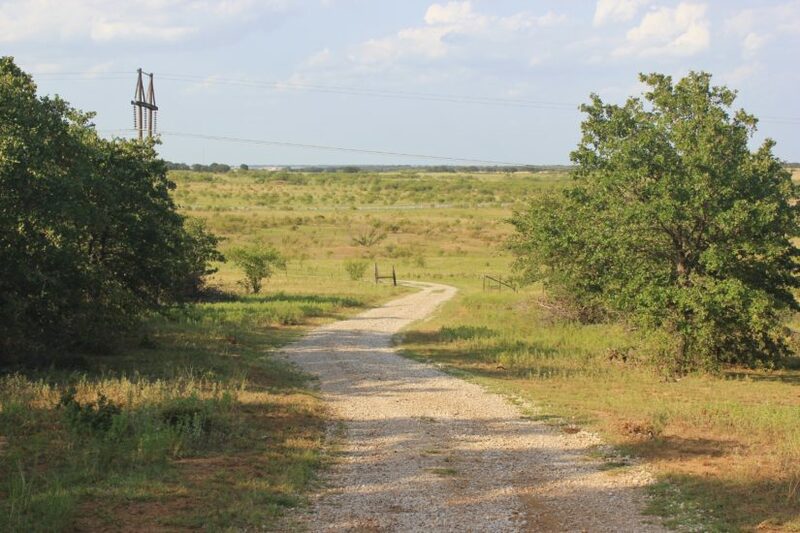 The entrance and easement road is used only by the land owner of the 30 acres that joins the subject property and the owner of the house. 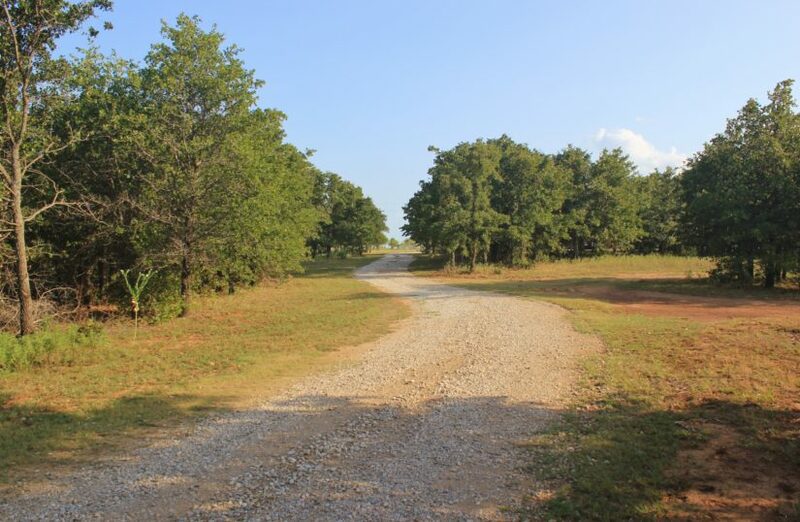 The easement road is what allows the home to retain its privacy, because it takes you 1/3 of a mile off of the main road, behind a bunch of trees. 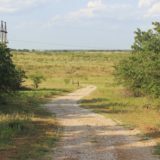 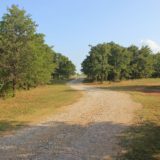 The new owner will have the right to blade, gravel or otherwise maintain or improve the road as they see fit, as will the owner of the 30 acres next door. 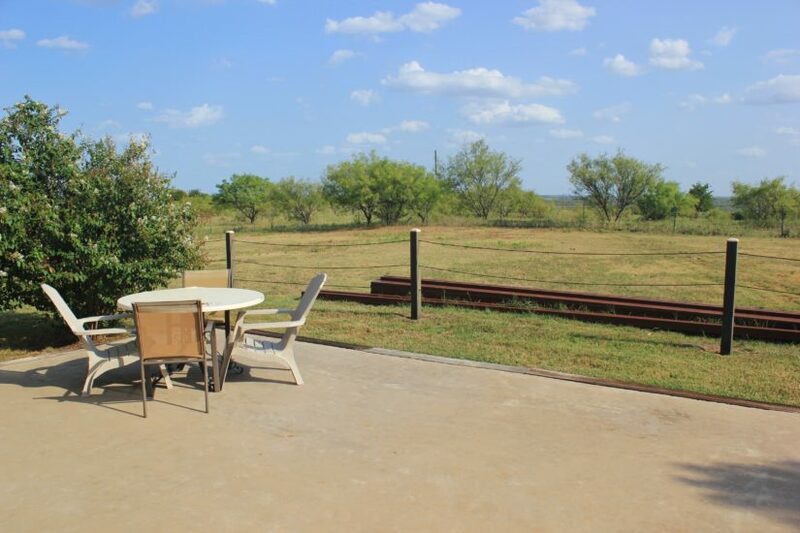 The custom gated entrance can not be altered by the owner of the 30 acres without the house owner’s consent. 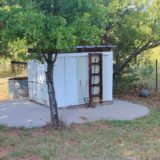 At the same time, the house owner will not have any maintenance responsibility for the gate or road. 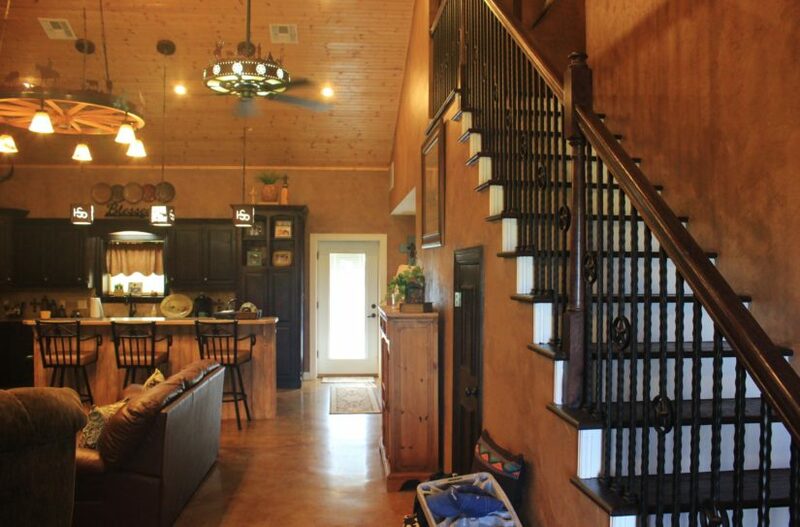 The house was built in 2011 and has 2,268 sq ft, per the owner. 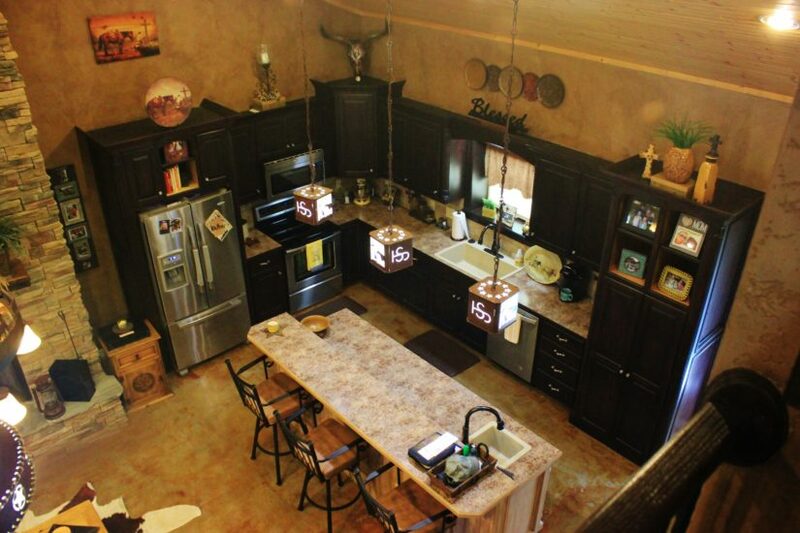 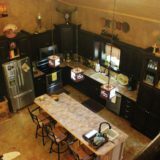 It is an open concept home, with the kitchen and living room combined. 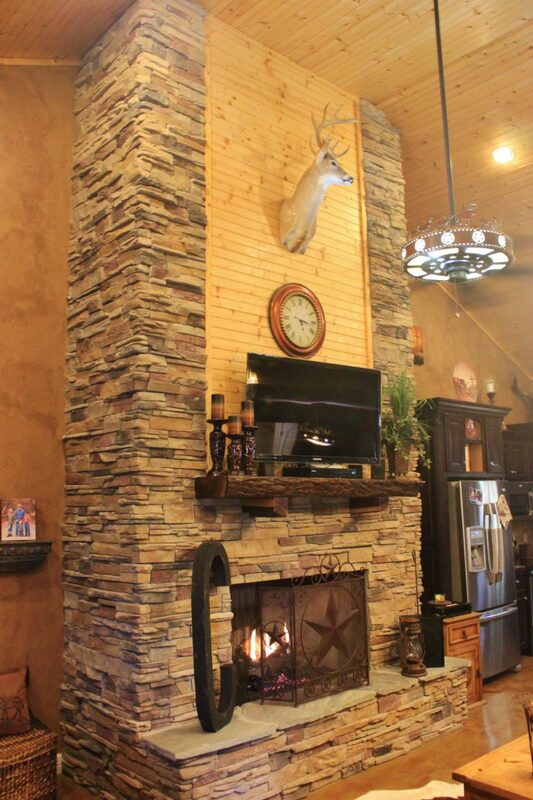 This room has 20′ vaulted ceilings with wood paneling, custom iron lighting fixtures and a tall stone gas fireplace. 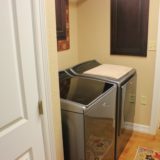 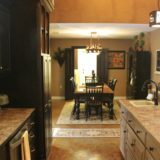 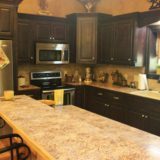 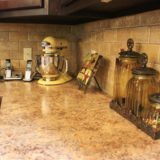 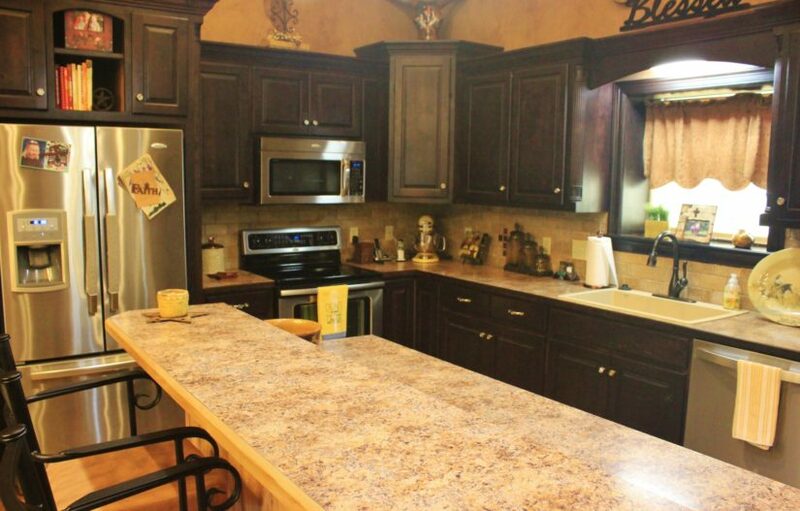 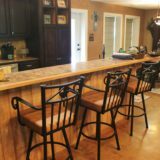 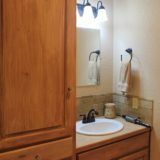 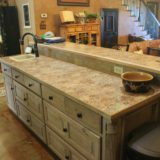 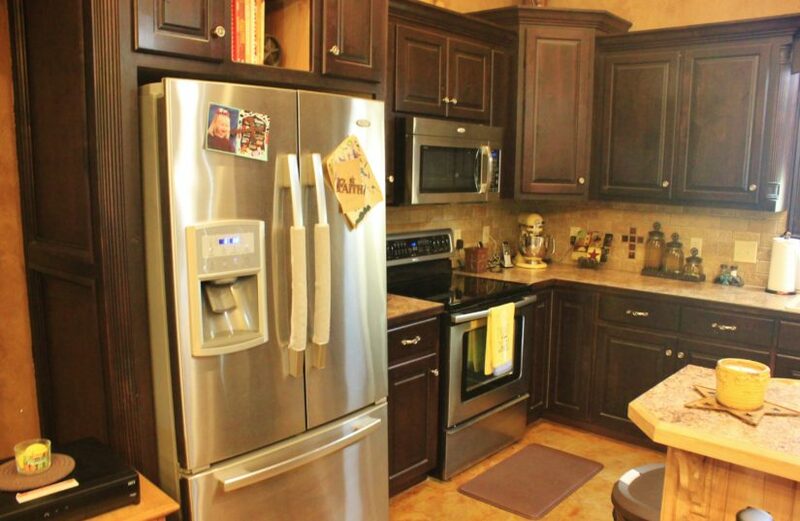 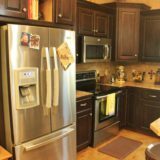 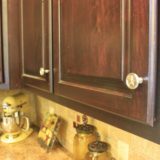 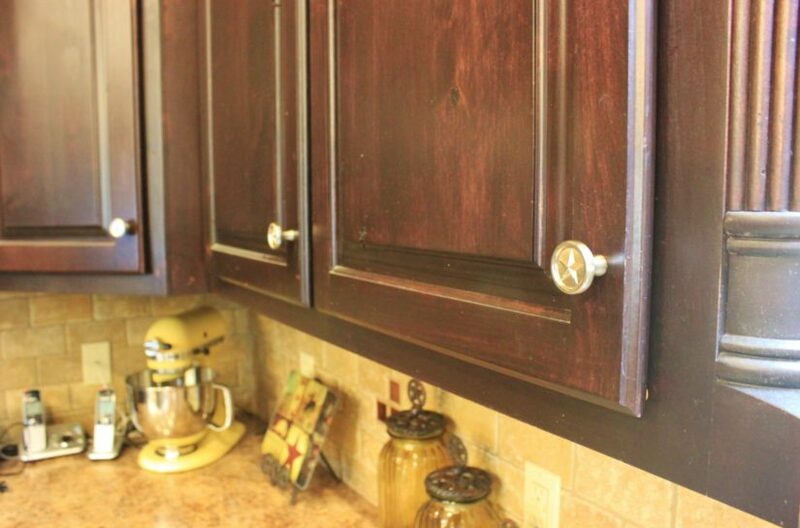 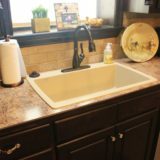 The kitchen has all custom cabinets and knobs, a large double sink, Whirlpool stainless steel appliances and a eat-at bar with its own single sink. 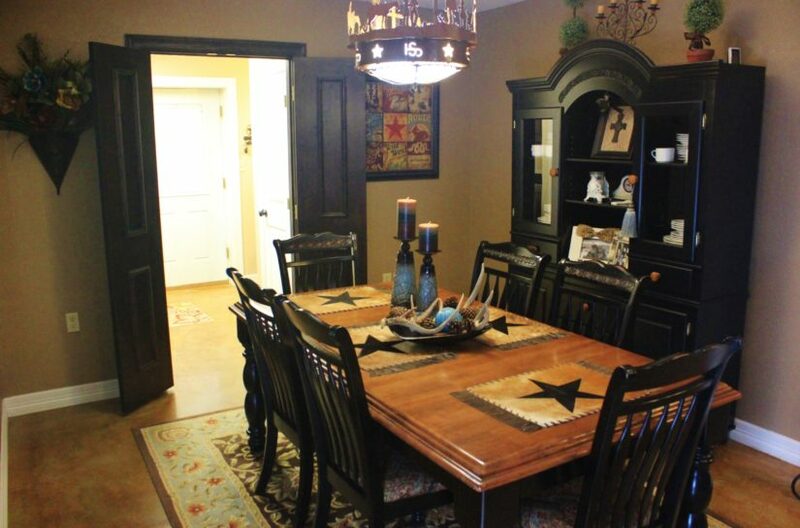 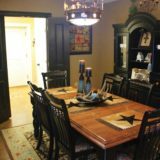 The dining room is just off the kitchen too, for easy access. 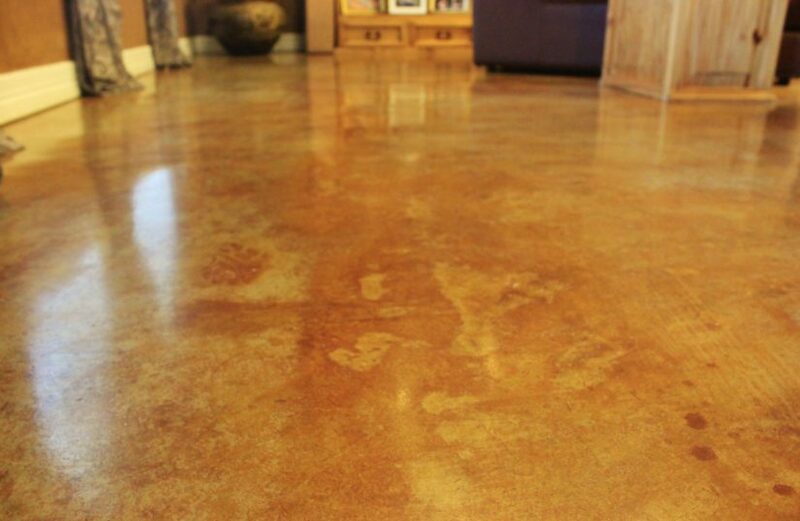 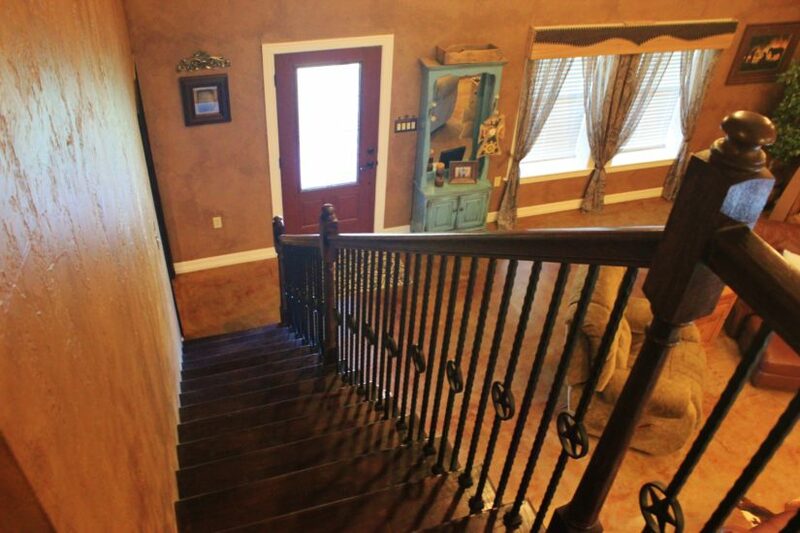 The downstairs’ floor is beautifully stained, polished concrete. 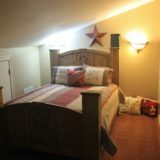 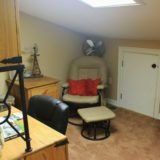 The master suite is located downstairs. 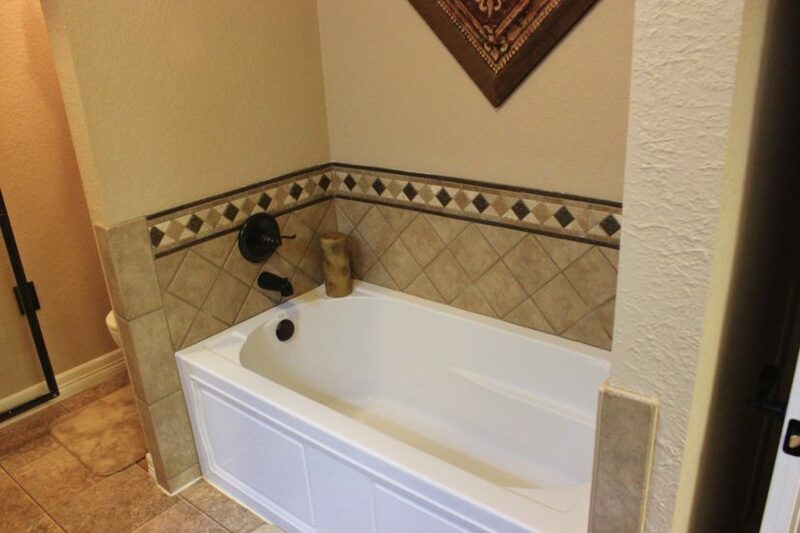 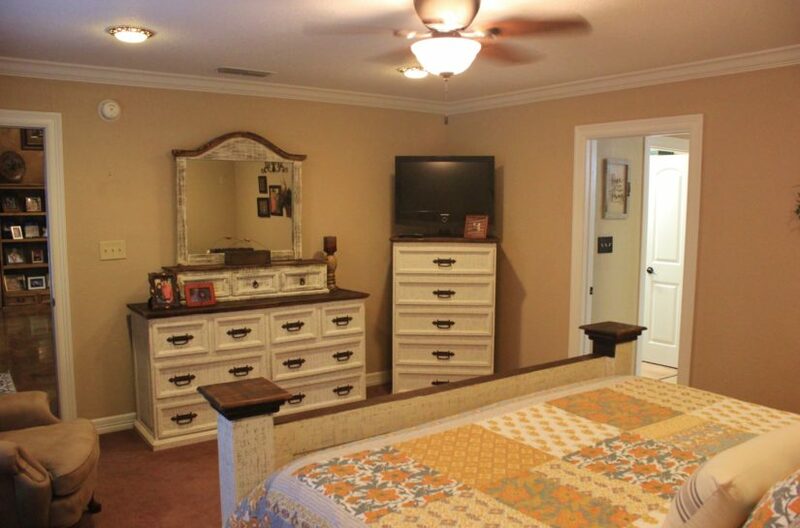 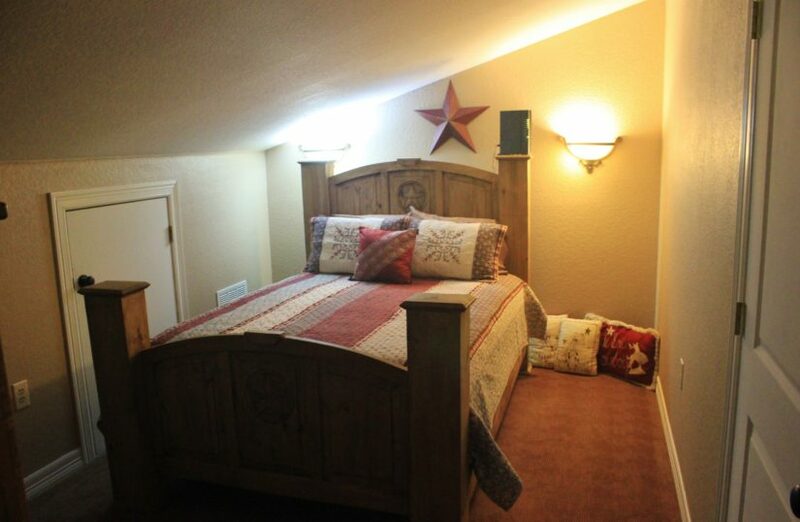 It has carpet floors and crown molding in the bedroom and tile in the bathroom. 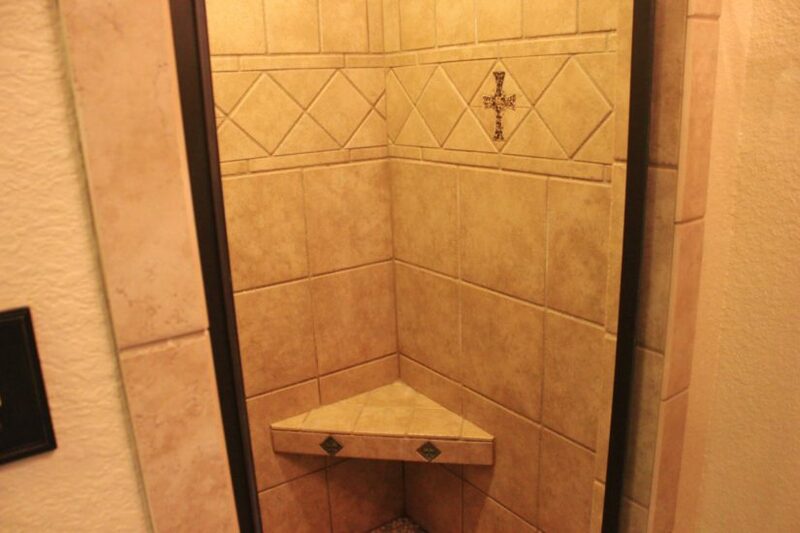 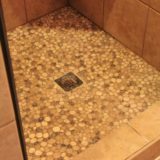 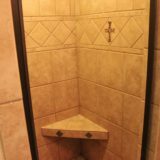 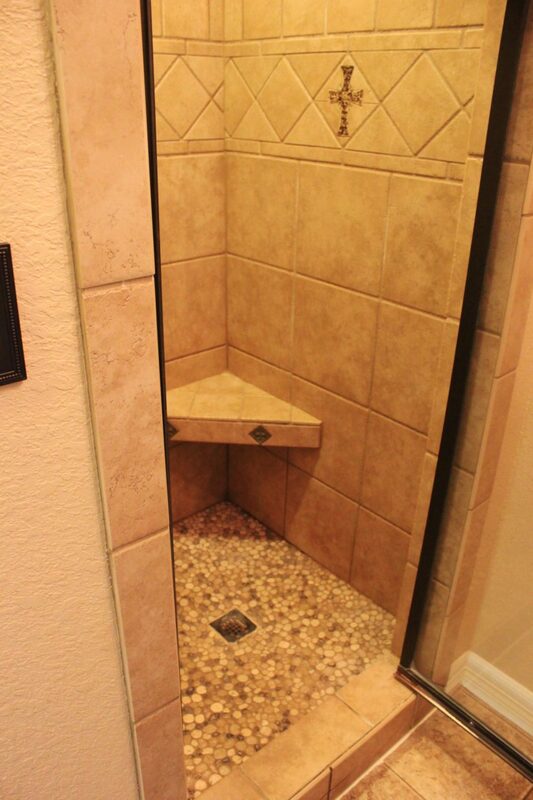 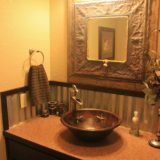 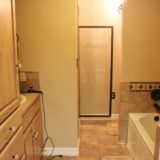 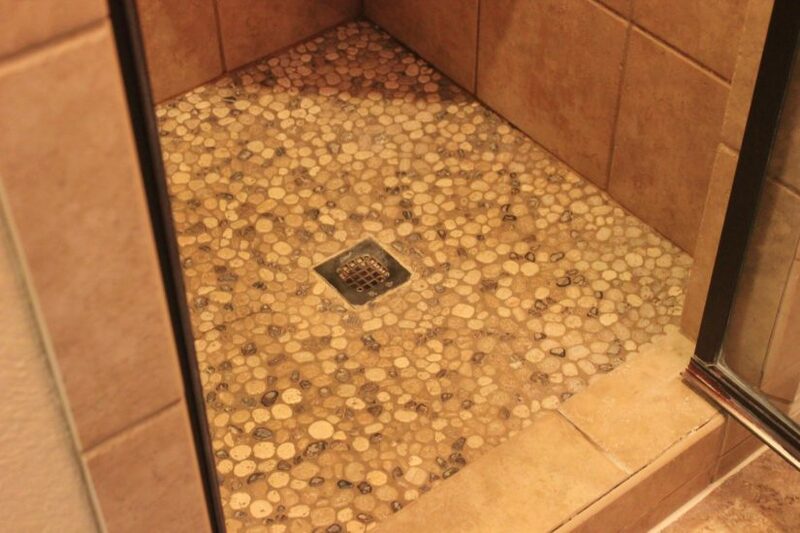 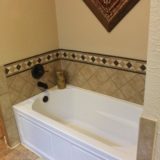 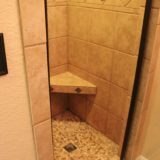 The bathroom has a separate tub and walk-in shower; the shower has a river rock floor and crosses inlaid into the wall tile. 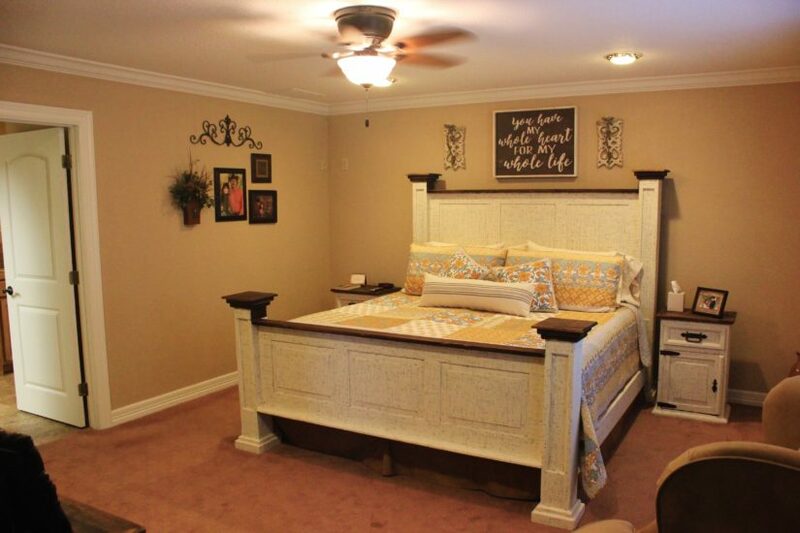 The master suite also has a large walk in closet with built-in shelving. 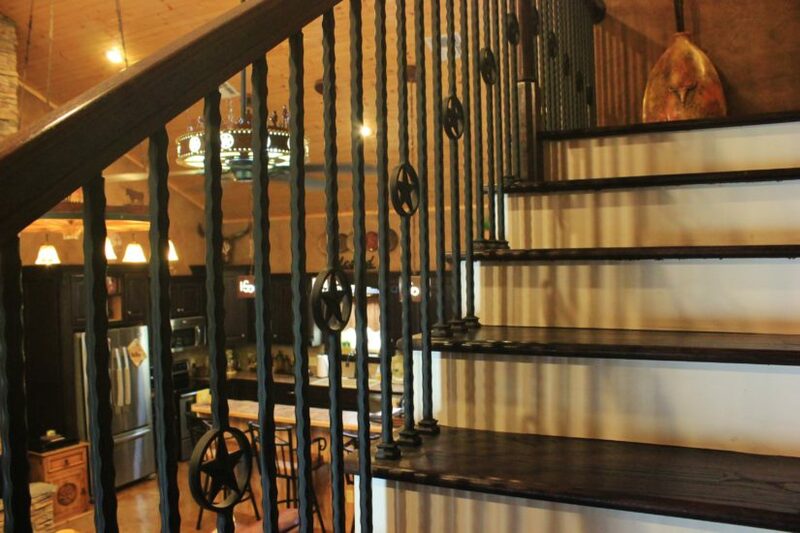 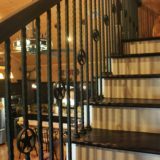 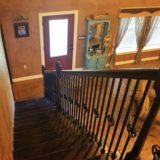 A staircase with rod iron railing takes you upstairs to the two other bedrooms, which share a hallway bathroom. 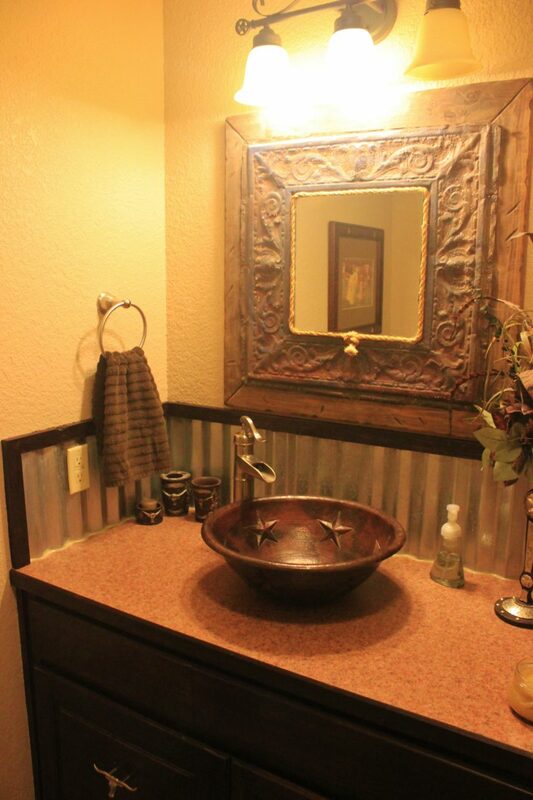 This bathroom has a shower only; the sink is a copper bowl and its iron light fixture matches the stair railing. 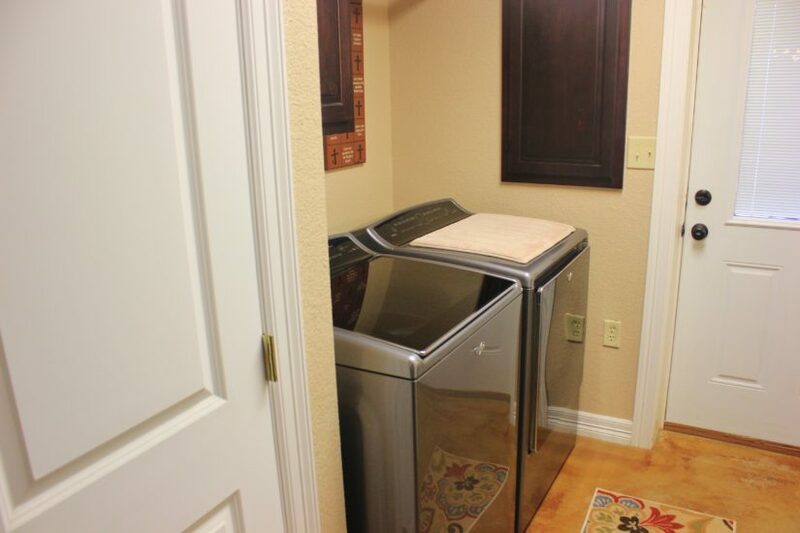 Downstairs is a separate utility room with washer/dryer connections. 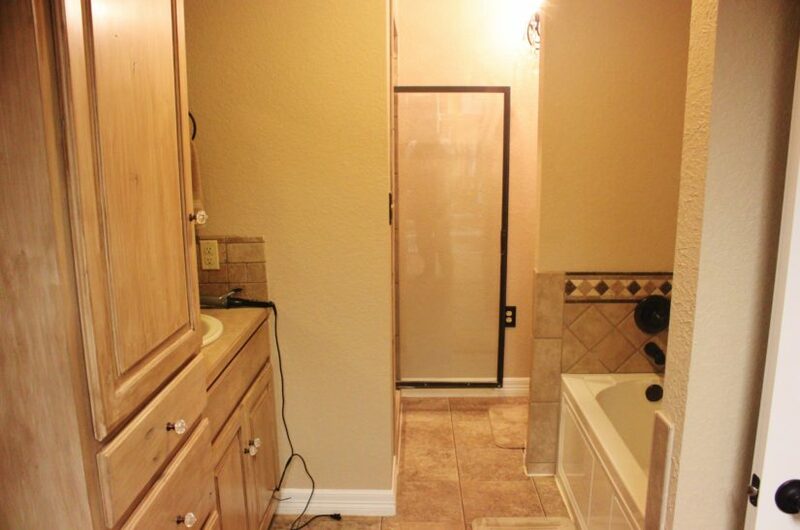 The home has a new water heater too. 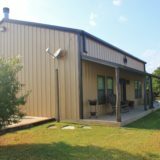 As a barndominum home, it has a metal exterior. 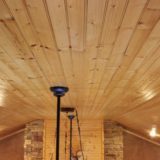 After the frame was built and exterior panels attached, the owner sprayed 8″ of foam insulation across the walls and ceiling. 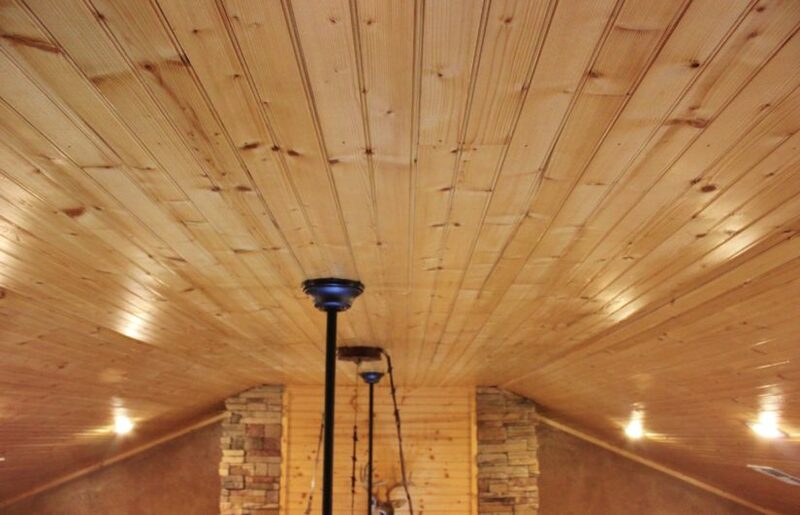 Then, when the interior walls and ceiling were installed, R13 batting was also added. 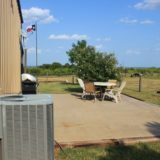 Both the east and west sides have covered porches, and a second slab was poured on the north side that offers the new owner a good place to add an outdoor kitchen or entertaining area. 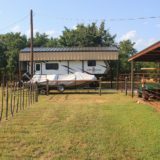 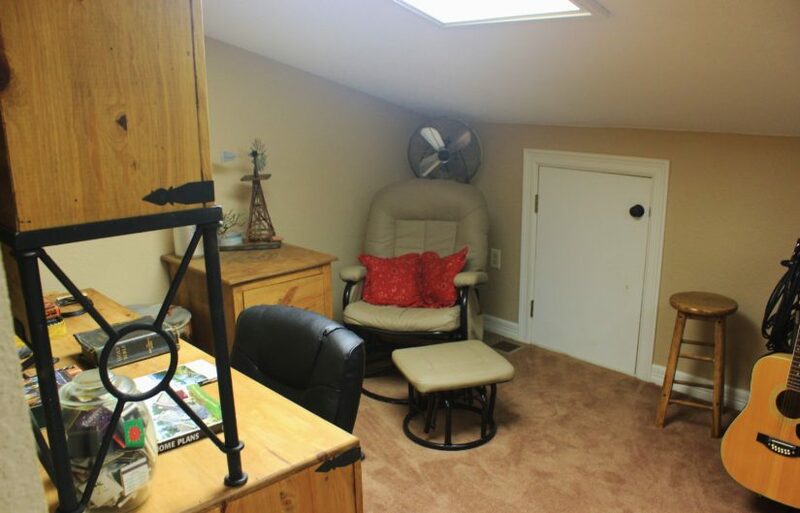 The home also has a two car carport on the south side and an RV carport with electricity. 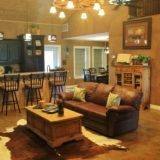 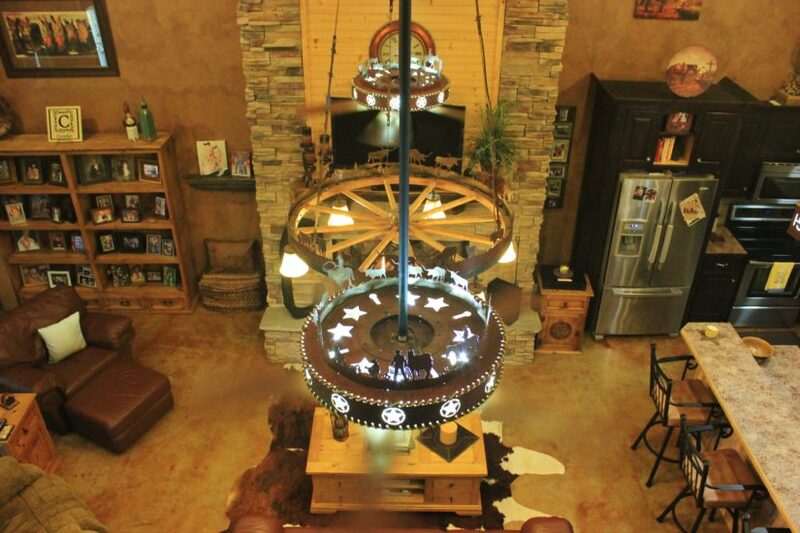 The home is serviced by poled electricity and a 215′ water well that will produce 10 gpm. 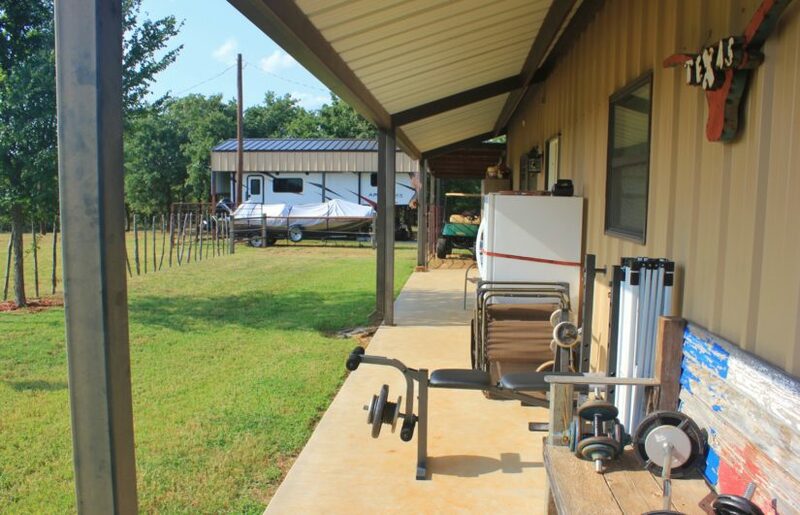 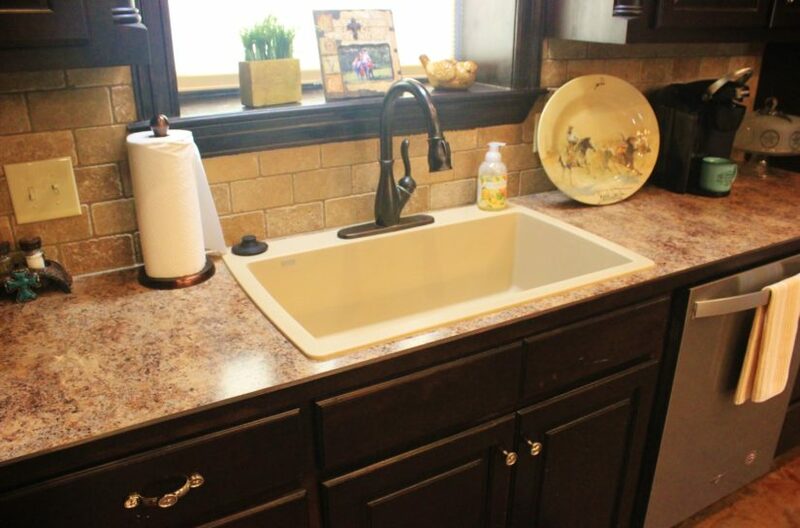 The home has two 500 gallon septic tanks, both of which were cleaned out and serviced a year ago. 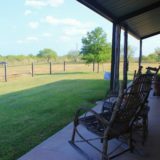 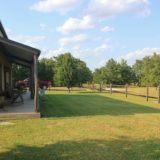 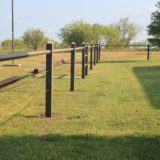 The yard has a fence all the way around it, to keep horses out. 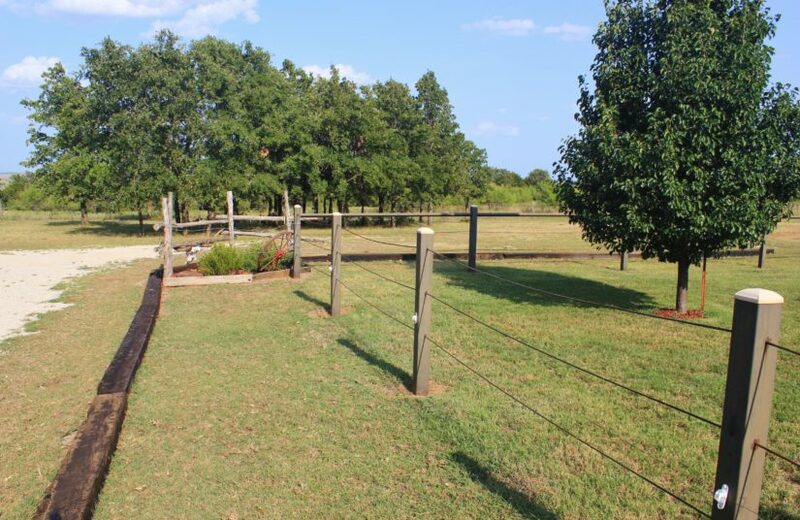 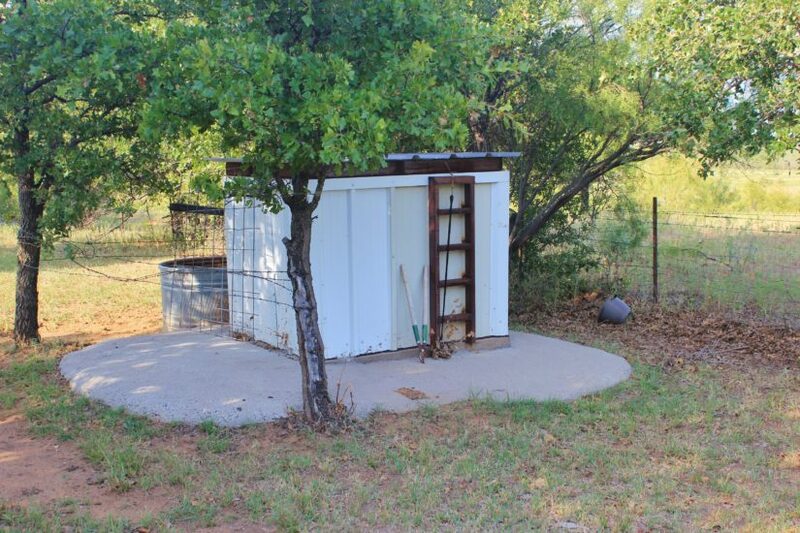 The two acres has a barbed wire fence around it, with metal t-posts and a private gated entrance. 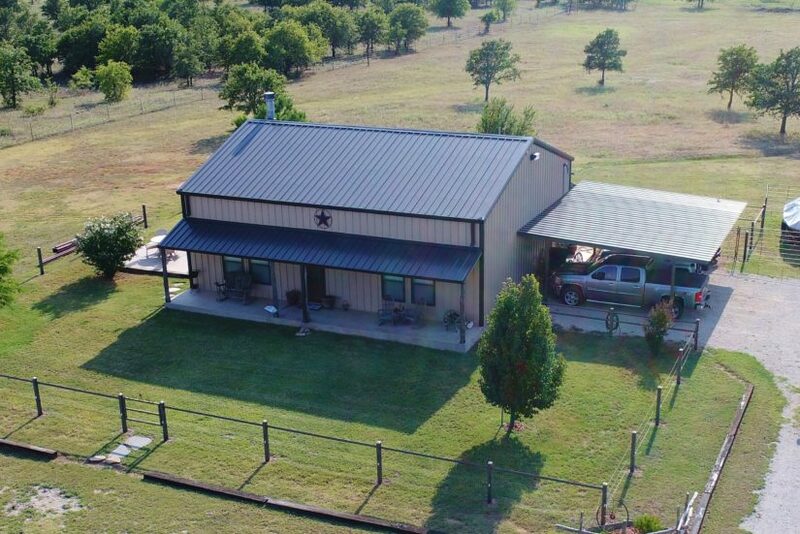 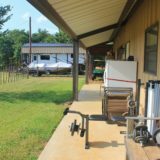 The house and yard take in around 0.25 acres, so you still have 1.75 acres of land that you can use for animals or to build a shop, barn, stalls, etc. 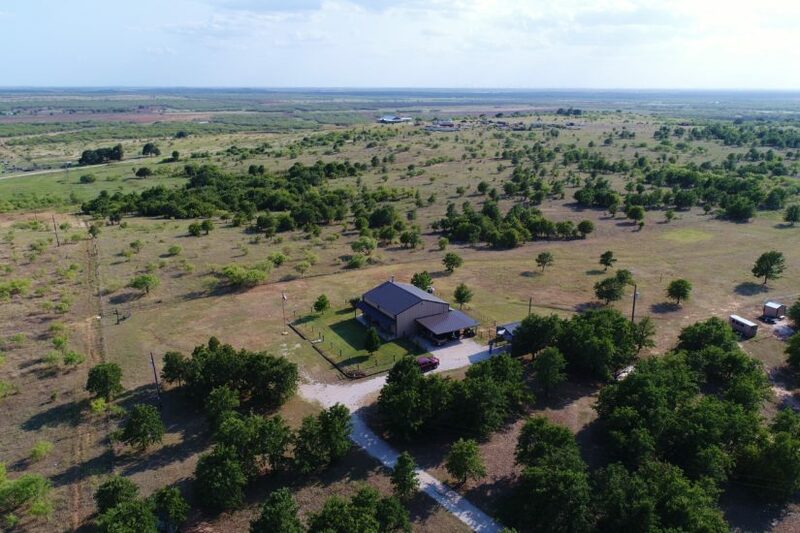 About half of the land is in grass and half has post oaks. 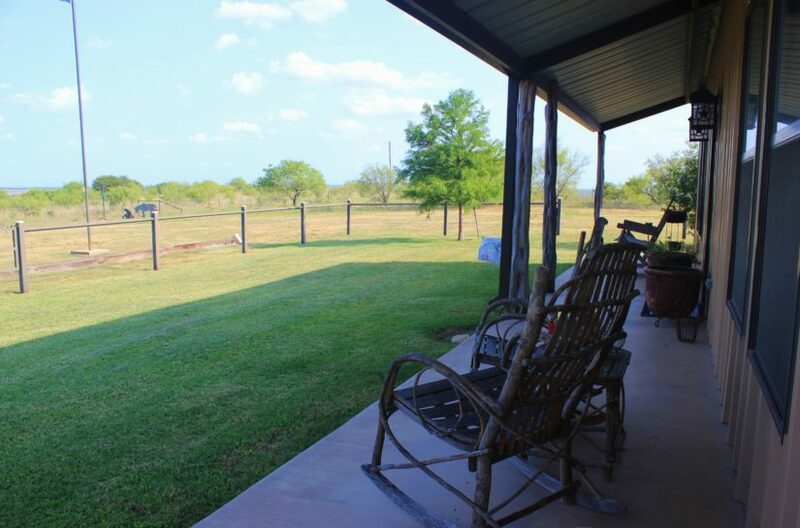 The home has some really nice views across the rolling hills to the south. 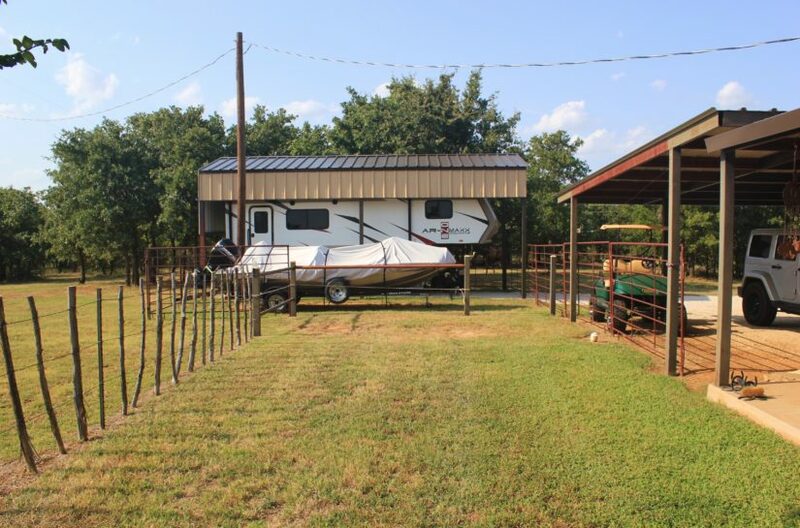 It’s not uncommon here to have deer or turkey crossing the yard! 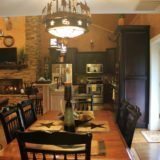 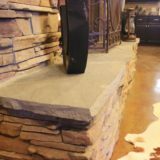 You could even do some hunting with a feeder in place. 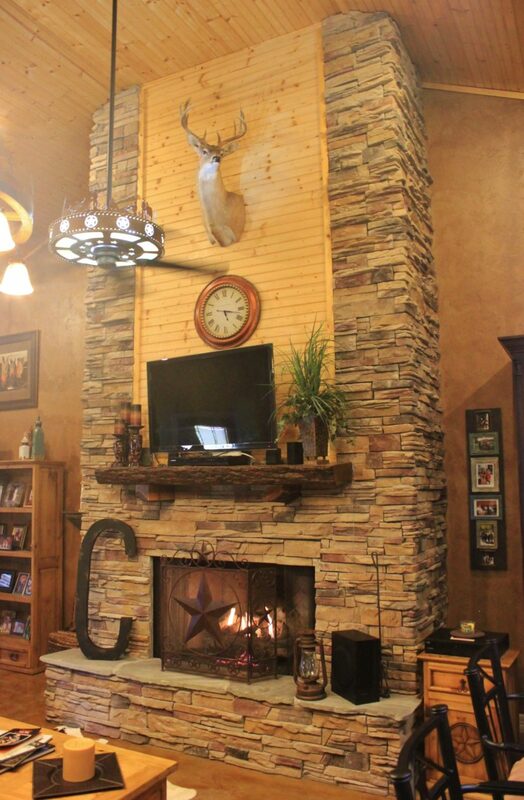 Bucks are nice in southern Clay County, and there is real potential to shoot a trophy. 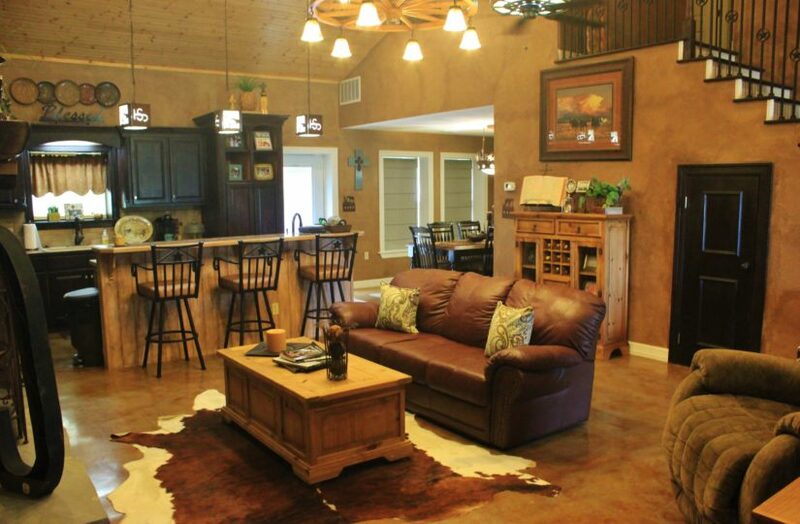 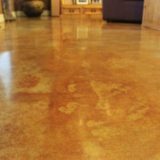 For its size, the home and property have a lot of WOW factor! 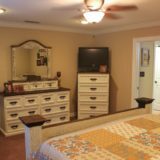 Everything is very well kept and in excellent condition. 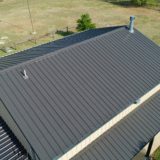 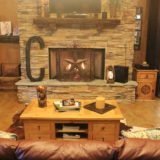 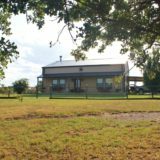 This is a perfect place for the person wanting a relaxing country home for an affordable price. 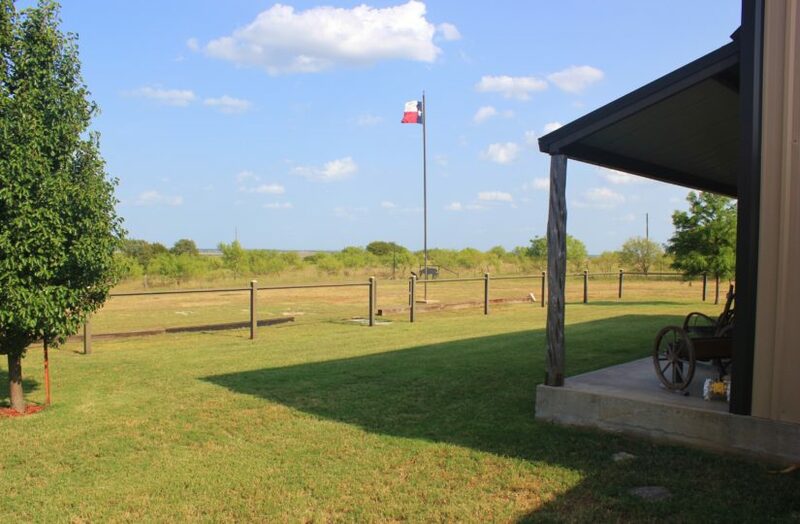 It is also located in the Midway ISD, which is a top rated school. 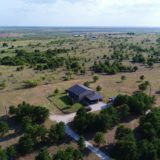 Seller will convey a new survey. 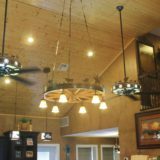 A few personal items inside the house that have the owner’s brand on it will be reserved, including some of the light fixtures. 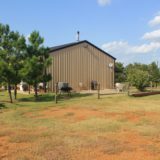 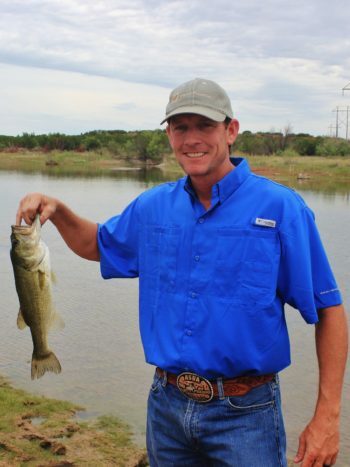 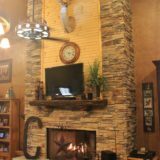 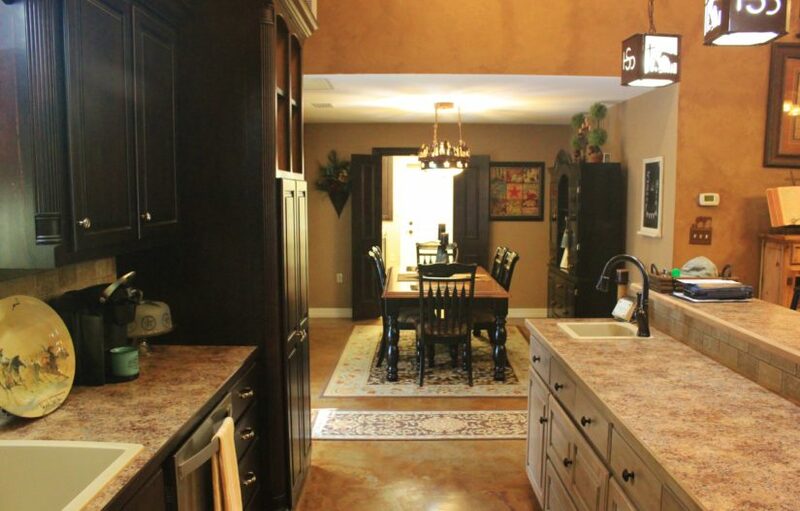 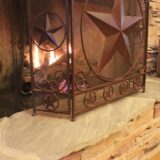 For more information or to arrange a private tour, contact agent Beau Byars at cell phone (940) 224-3183.